Clamps of various sorts taming the strips. gaps are left for “cheater” strips. This is a good view of the pine inner stem on the plywood bow form. The stem is finish nailed at either end and tack glued hopefully for easy removal later. Note the 1/4″ mahogany and full 3/4″ yellow pine strips at the shear. After my stapler broke I elected to used 18 gauge nails to hold the strips on the forms. Clamps and, at times, masking tape held the strips in line for the most part. I think I’ll like the residual nail holes as they indicate the hand-made quality (emphasis is still on quality). All clamps on deck! Still needed more. Some strips had a real twist near the stems. Judicious use of a heat gun helped loosen the ligaments in the wood to allow for easier twisting of the strips where necessary. Otherwise, I suspect the wood might have protested and snapped. This is a good technique here which also helped warm the shop a bit. Fender washer & drywall screw persuade a particularly stubborn strip. Appears messy, but stripped to keel on port side. Hot melt glue made fast work of the bottom’s more compliant strips. A close up of marching slugs. Joints appear fairly tight. Hull shaping will tell. 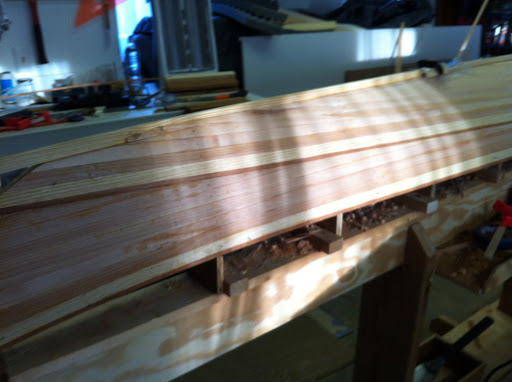 Centerline shown with 1/8″ offset for keel strip. 1st pass at triming to the keel. 2nd keel trimming to just inside of the line. After the 2nd keel trimming I loosened the hull from the forms just enough to sneak a plane in to true up the work. Not hard at all really. Port aft quadrant. 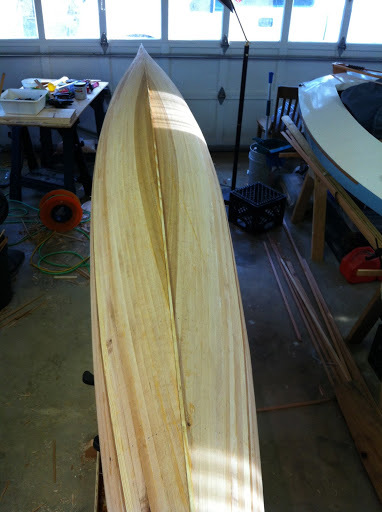 Yellow pine keel installed. Trimming to commence. I had segregated or book matched the strips as they came off the saw, but then promptly ignored the work as I stripped the boat. It was only at the tail end of the process did I realize my negligence. Luckily the wood is relatively the same in color. Call it character. I will monitor it closely on the deck. End view. I was late to bookmatch the strips. Nice football at bottom. I decided to repeat the bottom sheathing process to starboard. 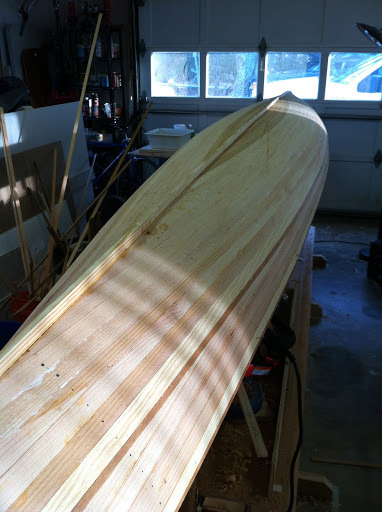 Strips were trimmed close to the previous side and then trimmed to allow for a 1/4″ yellow pine keel strip. Fairing of the starboard keel joint used a small chisel as the port side obstructed getting the plane in there. A rabbet plane may have worked. Must add that to my wish list.